Christian Ernst Graf came from a cultured, musical family and gravitated to the Netherlands - though whether because of a buccaneering sense of curiosity, or because he racked up debts, history doesn’t relate. Nevertheless he soon secured positions as organist and music director before embarking on a long and successful career at the court of the House of Orange. Accurate biographical information seems to be sketchy but this disc concentrates on his chamber music, as opposed to anything more publicly ceremonial. The quartets can’t be dated with any certainty but they very much reflect the spirit of ‘Sentimentalism’ or Empfindsamkeit that was making aesthetic inroads into works of the 1760s and 1770s. Graf’s quartets are somewhat transitional in that and other respects in that they chart an instrumental move from the Baroque to the Classical. The instrumental distribution is for strings and harpsichord or for two violins, viola and the cello functioning as an obbligato instrument. We have not yet arrived at a conventional Classical distribution of forces. What Graf can do well is to spin an ingratiating and sweetly insinuating melody line. There’s no doubting the strength of ideas in the opening Adagio of Op.17 No.4 in D major. It reflects his promotion of grace and elegance in his music for chamber forces and, in the central Allegro, his appropriation of a kind of modified Mannheim Rocket for limited forces. The facility for vocalised lines is reinforced in the Quartet in F major, without opus, where the aria that unfolds is accompanied by a finesse that is really quite startling in its elegant purity. The Fugue that follows is tidy whilst the Andantino with variations that serves as the finale is graceful and flowing. Leopold Mozart and even C.P.E. Bach might have appreciated its cleverness. Op.17 No.1 in G minor has a lot of imitative writing and a democratic parcelling out of melody lines, Graf avoiding a first violin concertante approach whilst he skilfully varies material in the D major without opus number. The cello here offers some thrumming that animates the writing still more. In fact all the quartets have something to offer, and if not epochal – no one would claim he is an innovator – he does display real command of his forces and a strong sense of characterisation. Try the tasteful warmth of the G major’s Adagio, or the comic elements of its Presto finale. 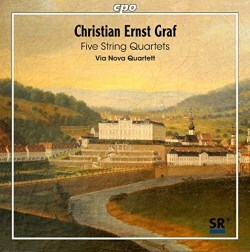 The original instrument ensemble Via Nova Quartett plays with spirit and a strong ear for Graf’s sweetly melodious ways. Sometimes when they encounter some dissonances the playing can sound a little effortful but in the main they make a good case for these seldom-explored works. Recorded sound is good and the notes expansive about Graf’s milieu, though as noted and presumably because of a lack of historical records there’s nothing too concrete about the man himself.